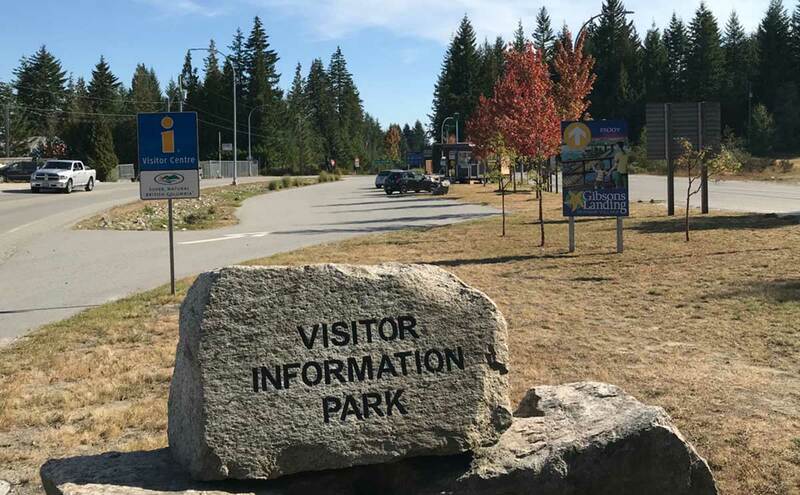 Visitor Information Park is on Stewart Road (near the top of the bypass en route to the Langdale ferry terminal). During summer, traffic counts on the “Bypass” 17,000 vehicles per day. This area is the gateway to the entire Sunshine Coast (from Port Mellon to Lund), and had long been identified as a missed opportunity to welcome and orient visitors to Gibsons and region. In 2010, a way finding map erected by the Chamber in 2006 blew down in a wind storm, bringing new urgency to the situation. The GDCC launched a campaign for a Visitor Information Park in October 2010, and began raising funds. Government sponsors included the Island Coastal Economic Trust, Town of Gibsons, District of Sechelt, Sunshine Coast Regional District, Powell River Regional District, Sechelt Indian Band, many sunshine Coast Businesses and Community Organizations. Community volunteers contributed approximately 650 hours of work, and 52 local businesses donated money or goods and services in kind. Total project costs were over $260,000, of which approx. $110,000 was donated. The GDCC is grateful to all the VIP Sponsors who made this project possible. The Visitor Information Park opened officially in September, 2011. 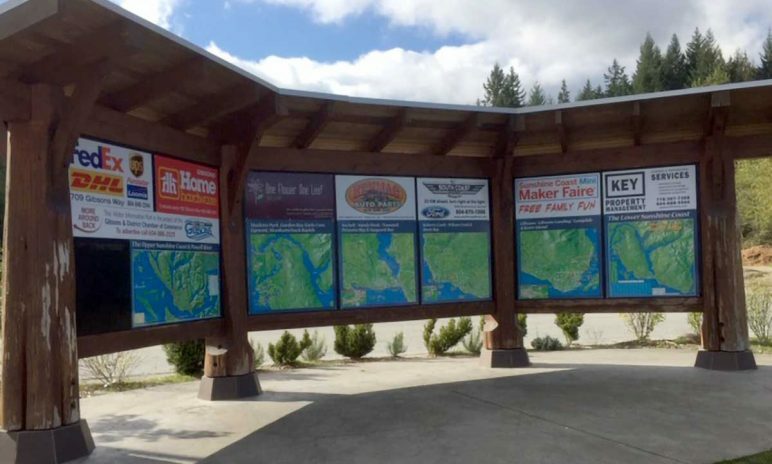 Visitors can now pull in to view large maps of all the communities on the Sunshine Coast — from Langdale to Powell River. Available is information about local attractions, points of interests, special events and businesses. The park includes landscaping, solar lights, public toilets, doggie bags and rest stop. The pull-out was designed to be accessible for the mobility impaired. In the Visitor/Tourism season a mobile Visitor’s Kiosk (constructed by Click Homes with stairs by HL Enterprises and Solar Power by APS) is located at the VIP to provide personal information and details from a trained visitor adviser. 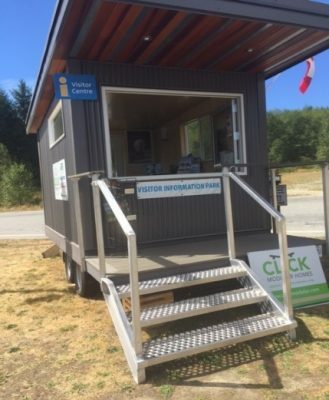 The kiosk is open daily during peak ferry travel times for the summer tourism season to provide information about Gibsons and the entire Sunshine Coast. The GDCC offers advertising panels at the VIP. For more information, see our Promotions page or contact Chris Nicholls, the Chamber’s Executive Director at 604-886-2325 or exec@gibsonschamber.com. The grassy area on the north side of the signs is available for rental to groups wishing to use as staging area, promote a product, event or activity. Call the Chamber at 604-886-3235.